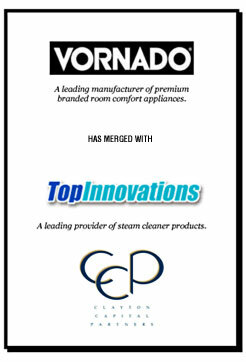 Clayton Capital Partners is pleased to announce that its client, Vornado Air, LLC has merged with Top Innovations, Inc., a Missouri-based provider of household steam cleaner products. Top Innovations, Inc. (www.topinnovations.com) is a Missouri-based provider of household steam cleaner products. The company specializes in steam presses, garment steamers, steam floor cleaners, handheld steam cleaners, steam cleaner parts, handheld vacuum cleaners, professional steam cleaners and professional garment steamers. Vornado Air, LLC (www.vornado.com) is a Wichita, KS based designer and manufacturer of high-end whole-room air circulating, heating, air purifying, and humidity control products. The Vornado brand is known as the leading designer, manufacturer, and supplier of air comfort products. Since 1989, the Vornado line has expanded to encompass more than 25 models across five distinct comfort categories including air circulators, Air Purifiers, whole room heaters, whole room humidifiers and oscillating fans – all bearing the Vornado brand, the most trusted brand in air comfort for more than 50 years. Clayton Capital Partners (CCP) is one of the nation’s top investment banking firms providing M&A advisory services to a diversified client base of middle-market companies. Clients have come to rely on our expertise, our commitment to client services and our innovative ability to create value. The principals at Clayton Capital Partners focus on satisfying the complex needs and objectives of our clients through our core business practices –Investment Banking and Exit Planning. Together, our professionals have acted as financial advisors in more than 200 advisory transactions with an aggregate value exceeding $1 billion. If you would like more information about this transaction or Clayton Capital Partners, please contact Brent Baxter at (314)725-9939 x 526 or via e-mail at bbaxter@claytoncapitalpartners.com.